We endow our customers with an assortment of grosgrain ribbons and this amazing ribbon collection also includes polka dot ribbons. 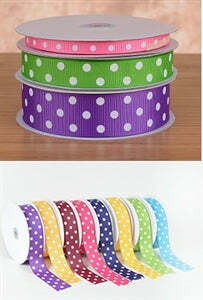 These types of ribbons are mostly used for party decorations and even for wrapping gifts. We offer the best quality ribbons, wedding supplies, and other stuff for managing craft projects at affordable prices. You can do fabulous looking decorations with the use of grosgrain ribbons and show your creative side. These types of ribbons are in high demand as these look classy when used for embellishing favors, dresses, and gift boxes. Get the best kind of wedding and craft supplies at BB Crafts and amaze your guests with mindboggling decorations and adornments from top to bottom. In the present scenario, no one prefers to waste their hard earned cash for getting done with the fancy looking gift packaging from the market as this may include a lot of investment. Therefore, you can easily save this money and get done with the packaging and decoration work on your own with the use of fancy and colorful ribbons we provide at BB Crafts.